Manu and the Spurs never die! Kawhi Harden had 33 points, 10 rebounds and 10 assists. 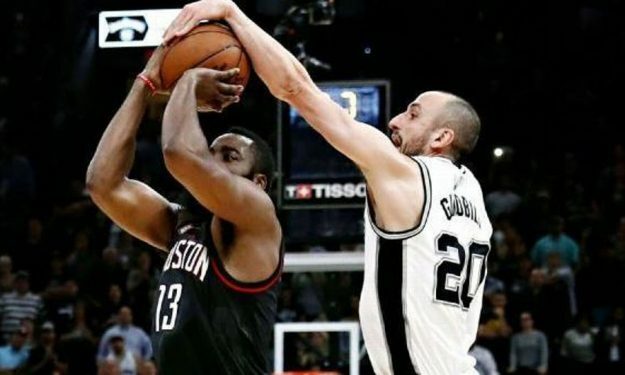 He had a chance at a potential tying 3-pointer in the final seconds of OT, but was blocked from behind by Manu Ginobili. Leonard had 22 points and 15 rebounds in 38 minutes before exiting with an injured right ankle. He stepped on Harden’s foot while running back in transition with 5:37 left in the third quarter and then played limited minutes before sitting out overtime. The Spurs already were without Tony Parker, who will miss the rest of the playoffs after surgery to repair a ruptured left quadriceps tendon. Leonard said he will play in Game 6 on Thursday in Houston. Spaniard Pau Gasol added 5 points and 4 rebounds for the winners, while Swiss Clint Capela finished the game with 9 points and 11 rebounds.